Thank you, God for not asking me to walk around naked. Those words don’t show up often in my prayers but today I needed some perspective. I am reading through the book of Isaiah and came to a passage that shocked me. Isaiah had asked God to use him (Isaiah 6). He had submitted everything to God. 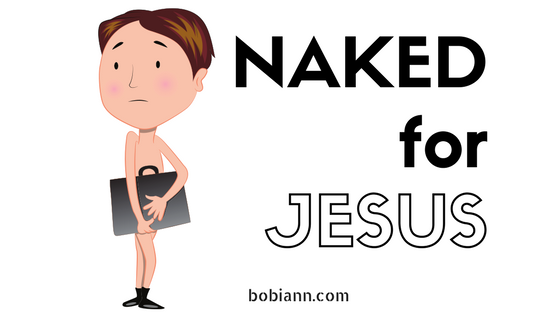 When God asked him to remove his clothes and walk around naked (for 3 years–not just a quick streak around the block), he did it. When I think about the reality of God’s request, I am amazed at Isaiah’s obedience. Lordship is hard. I want it to be easy. I want to sail through my days without having to fight my against my flesh. But then there is reality. Today I’m not sailing…I’m trudging. I’ve been whining to God lately. I don’t think He minds. In fact, I think it is because I’ve come to Him with complete honesty that He brought me to Isaiah 20. He showed me an example of a servant who was asked to do something much harder than I. …well, let’s just hope He doesn’t. But God has asked obedience of me and I don’t always want to comply. Today, I’m saying “yes” to Jesus. I’m following in the footsteps of Isaiah’s obedience to do as I’m asked and trusting God has a big picture plan that brings glory and honor to His name. Would you join me in saying “yes” to God in the assignment He has put in front of you today? Your message today really spoke to me!!!! Love you, Friend. Miss you so much! Yes I’m trying to walk with God. I do often stumble, but continue to try to move forward. great question. God was showing by Isaiah’s demonstration what would happen if the people didn’t repent. They would be ashamed and their dignity stripped from them. Powerful, Bobbi Ann. He is worthy even of that. I remember David getting a little undignified in his worship, much to the dismay of his wife! yes…I thought of David too. The difference (the best I could tell) is that David did it because he was wildly celebrating Jesus. He shed his clothes and got a little crazy! Isaiah on the other hand wasn’t celebrating. He was following instructions. There is a fundamental difference in doing something of your own volition (like its your own idea) and being asked to do it. I always do better with carrying out that which fits into my own agenda and ideas. Unfortunately I’m not as good at letting God shoot His ideas at me!